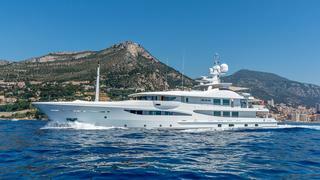 The 52.3 metre motor yacht Lady Nag Nag has changed central agencies and is now listed for sale with Burgess. Designed by Tim Heywood and built in steel and aluminium by Dutch yard Amels, she was delivered in 2008 as one of the yard’s 171’ Limited Edition Series. Lloyds classed, she has a voluminous interior designed by Laura Sessa to accommodate 12 guests in six cabins consisting of a main deck full beam master suite, two doubles and three twins, all with LCD television screens and en suite bathroom facilities. In planning the interiors of this series, Laura Sessa was faced with the complex challenge of creating an interior that was attractive but also flexible so that customers’ individual tastes could be accommodated. She achieved this by using standard-sized wall panels and profiles, which could quickly and efficiently be adapted to the client’s preferences. In combination with careful material selection, colours and loose furniture, every interior can be unique. An extended sun deck on this yacht for sale is partly concealed by curvy raised bulwarks that swell up alongside the mast arch to create an area that is shaded and protected from the wind by glass doors. With a generous-sized pool and sun pads forward, a bar in the centre and sun loungers aft, this deck provides the full range of outdoor relaxation. Twin 2,100hp MTU engines give her a range of 4,500 nautical miles at 12.5 knots. Lady Nag Nag is asking €25,950,000.